UFC, the mixed martial arts league, will be sold for $4 billion, by far the richest sale in the history of professional sports. The sale dwarfs previous sales of any sports franchise. The Los Angeles Dodgers was bought out of bankruptcy for $2.1 billion in 2012, making it the largest sales price on record for a single franchise. Close behind was the $2 billion purchase of the Los Angeles Clippers by former Microsoft (MSFT) CEO Steve Ballmer in 2014. It is also a stunning profit for the founders of UFC, which stands for Ultimate Fighting Championship. Lorenzo (left) and Frank Fertitta just sold the UFC for a fortune. UFC was launched in 1993 and purchased for just $2 million in 2001 by casino operators Lorenzo and Frank Fertitta. Chairman and CEO Lorenzo Fertitta said it was nearly bankrupt and "literally going of business" at the time. The $4 billion sales price represents a 72% annual return, every year, on that modest original investment. "We saw an opportunity," Lorenzo Fertitta told CNN's Rachel Crane late last year. "We felt like there was a void in contact sports. We felt...if we put in the right rules and regulations...we could create an opportunity for business." UFC is now the world's biggest and most successful mixed martial arts league. The sport combines all different types of fighting including boxing, wrestling and martial arts. UFC was once considered a violent, fringe sport banned in some locations. But it's made great strides and become more mainstream over the 15 years the Fertitta brothers have owned the league. It now draws stadium crowds of up to 70,000 fans as well as large broadcast and pay-per-view audiences. Sponsors now include Bud Light, Reebok, Harley-Davidson (HOG), MetroPCS, EA Sports (EA), Toyo Tires and FRAM auto filters. 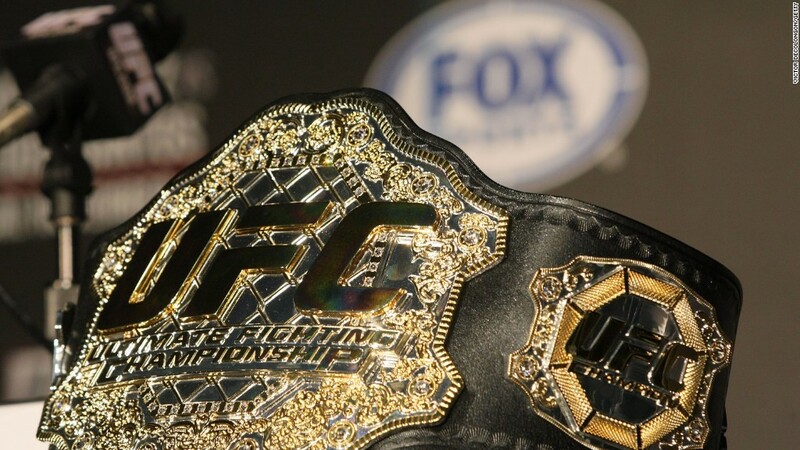 New York became the final state to legalize mixed martial arts in March. But the sport is still controversial. Critics argue that fighters, who are all independent contractors, do not make enough money considering the physical abuse they suffer. Fertitta defended fighter pay on CNN last year. "Our top athletes are making multiple millions of dollars," he said. "What is happening is as the sport grows, as compensation goes up, as revenue goes up, you're starting to see that the guys and the girls at the top are commanding a larger share of that pie." The possibility of fighters using steroids has also created a cloud over the sport. Fighter Nate Diaz said at a news conference in February that "everyone in on steroids, the whole UFC." Other fighters and UFC executives have denied that charge. UFC is being bought by a group led by talent agency WME-IMG. The group includes major private equity firms Silver Lake, Kohlberg Kravis Roberts (KKR), as well as the private investment firms of Michael Dell. 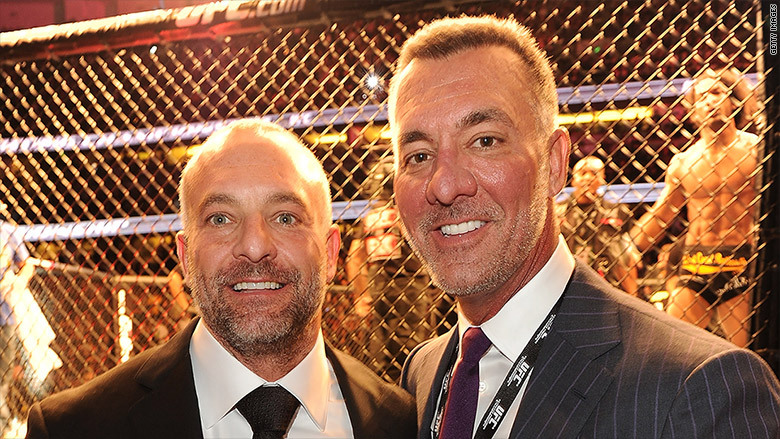 The Fertitta brothers will retain a minority stake in the company after the sale. The company had revenue of about $600 million last year, which Fertitta said was up significantly from a year earlier. Its largest source of revenue is pay-per-view fees. It also has a $700 million, seven-year broadcast rights deal with Fox (FOX), as well as an online subscription package for fans. UFC matches are broadcast in over 156 countries and territories, to nearly 1.1 billion television households worldwide, in 29 different languages. The price is far above some earlier estimates. The union UNITE Here did an analysis earlier this year that put the value at $2.2 billion. The closest rival to UFC that is publicly traded is World Wrestling Entertainment (WWE), which has a market value of $1.5 billion. The most valuable sports franchise in the world is believed to be the Dallas Cowboys, which Forbes estimates is worth $4 billion. British soccer team Manchester United (MANU) is the most valuable publicly-held team with a market value of $2.6 billion.